As cyn.in has grown more powerful in capabilities with the version 2, we have strived to simplify usage providing simple user interface components allowing knowledge workers to collaborate on and share content. 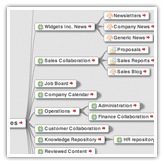 cyn.in has a mindmap view for every space enabling users of that space to browse through, visualize and directly navigate to the piece of knowledge that interests them. The live search was carefully designed to allow lightening fast searches. The results are displayed as you type displaying percentage relevancy of the content making the user experience highly rich.The info tip on a user avatar anywhere in cyn.in displays real-time up-to-date information about the user activity in his personal space and other spaces she is a member of.Theres a lot more user interface features that i’d love to talk about, probably in another post. Webresourcesdepot is a very interesting blog, with an abundance of useful resources like icons, templates etc. We strive to improve the user experience of cyn.in and would love to hear your suggestions in the comments. Check out the cyn.in screenshots.